The Hong Kong style Zha Jiang Noodles is very different from the Shanghai one. My first encounter with this version was introduced by a friend to an old fashioned noodle specialty shop in Hong Kong many years ago. Both Shanghai Zha Jiang noodle versions are totally different tastewise. The only one thing in common is that they are “lo mein”, meaning “stirred noodles” (“撈麵” in Chinese). 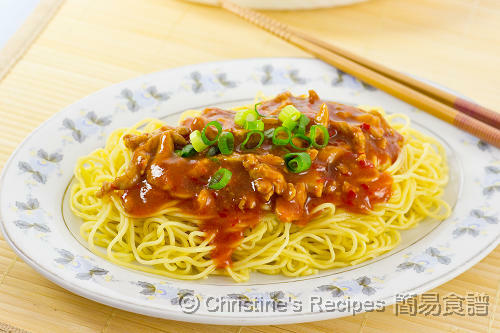 As for this Hong Kong version, the sweet and spicy sauce goes pretty well with the springy egg noodles. Every bite of the noodles stirred with the sauce will entertain your taste buds. Best still, you can whip up this noodle dish as a light meal on a hectic day. All you need is to find the good quality noodles. For making the sauce, I used a secret ingredient to make the traditional sauce more delicious. Wonder what’s the secret ingredient? Are you curious enough to give this dish a try? Mix the pork with marinade. Set aside for 10 minutes. Heat oil in a frying pan over medium heat. Sauté garlic until aromatic. Add the pork and stir fry until its surface turns white. Set aside. Discard the garlic. In the same pan. Pour the sauce ingredients. Cook over medium heat and bring it to boil. Continue to cook for 5 minutes. In the meantime, blanch the noodles in boiling water. With chopsticks or tongs, give the noodles a stir to loosen them up. Following the instructions on packaging, cook the noodles until al dente. Mine needs cooking for about 2 to 3 minutes. Lightly mix with a dash of sesame oil if desired. Place noodles onto 2 to 3 serving plates. Add the pork into the sauce. When it boils again. Add thickening and cook to preferred consistency. Drizzle over the noodles. Sprinkle spring onion for garnish. Serve immediately. You can use fresh or dried egg noodles, available at Asian grocers. I used fresh ones. Make sure not to over-cook the noodles because you don’t want them mushy. You might like to rinse them under cold running water to help keep their springy texture. The key element of this noodle dish is the sauce. The secret ingredient, tomato paste makes the sauce look more appealing and taste more delicious. 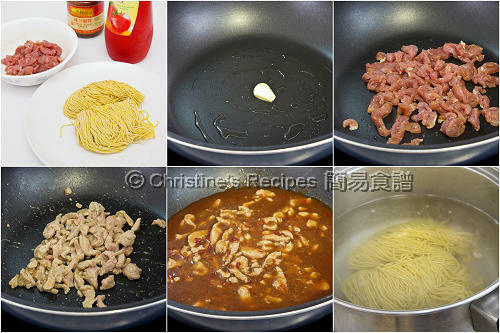 Make more sauce to mix with the noodles. Hope you’ll love it as much as I do. I love your blog and this recipe looks delicious. I was wondering what brand(s) of chilli bean paste you recommend? Thanks for your love of my blog. For making this dish, I used Lee Kum Kee chilli bean sauce. may i know if i can omit the chili bean sauce? as i have a toddler. will it taste weird? The traditional taste of this noodle dish is sweet and spicy. But for your case, you can omit the chilli bean sauce to suit your young one. It'll taste sweet only. No problem. My stomach is growling...this is really delicious, Chris. 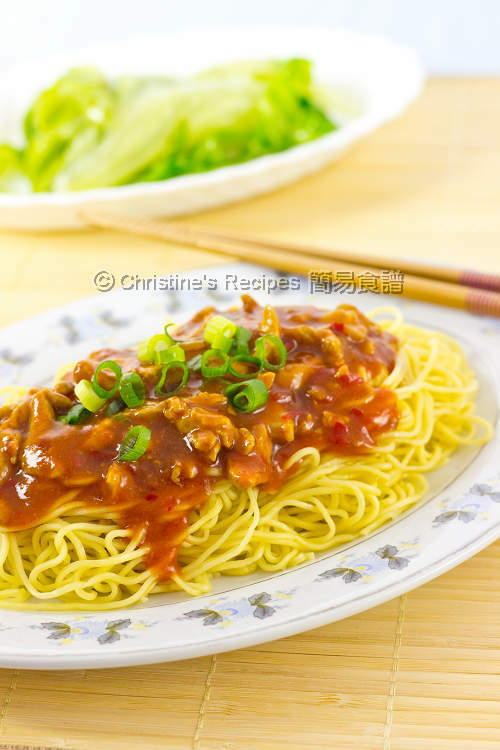 I'm going to test drive this recipe for sure because there are not many varieties of Chinese style noodles made at the resturants in Los Angeles. I'm so glad that I found your site and I decided to subscribe your recipes. Thanks a lot, Christine. Thanks for trying my recipe. Hope you'll like it as much as I do. I just enjoyed a 炸醬麵 in an eatery as my light meal the other way. I think I would have enjoyed it more if their sauce were as meaty as this. Is there a good alternative for the chili bean paste? Can I use sweet chili sauce instead? Or will it taste odd? Chilli bean paste is made from fermented soybeans with richer taste than the sweet chilli sauce. If it's not handy to you, you might replace it with sweet chilli sauce though. The taste won't be odd but a bit blank. i am accustomed to the cantonese version and was in for a shock when i ordered it in beijing. it was soupy! and not to be biased, but not as delicious. i'm looking forward to making this! Yeah, I reckon they are two different dishes even though they are called the same name. Is there a Chinese name for Chilli bean paste? Chilli bean paste is 豆瓣醬. You can easily find it at any Asian grocers.